John Newton’s “Amazing Grace” (1779) tops almost every list of the most popular hymns of all time. It’s been covered by Whitney Houston, Al Green, Willie Nelson, Ray Charles, Aretha Franklin, Steven Tyler, Alan Jackson, Carrie Underwood, Elvis Presley and thousands of others. The tune is beautiful, even when played by bagpipes. The poetry is rich. The song presents the Gospel of Grace. Its significance is both cosmic and individual. It takes us from our present, through death, into eternity. It’s the complete package. Feelings are becoming more and more important in our culture. Have you noticed that people no longer say, “I think” anymore? They always say, “I feel.” Although emotions are important, they are often given too much authority in our culture. We can see this swing in contemporary worship music. Choruses are added to the old favourites to give them the emotional lift they lacked in their original form. The music goes higher, the vowels go longer, hearts rise up, hands join hearts . . . There is nothing wrong with the addition of new choruses. We can critique older styles of worship for not engaging enough of our emotions and these new choruses actually lead to more holistic worship. The new choruses do go wrong when they are emotion for emotion’s sake–one of the indications that the mind is not invited into this emotional climax is that the words don’t really mean anything, or worse, they fail to connect to the rest of the song, or worse, they are incomprehensible. Why the need to add to the good ol’ hymns? I get it. Times are different. We like choruses now. The old hymns don’t have choruses. Why do we like choruses? Why does a song without a chorus just feel incomplete? It’s because, these days, we are very emotional. Not just Christian culture, but the culture at large. More and more it is our feelings that matter, sometimes at the expense of everything else. We might feel let down if worshipful feelings aren’t are not evoked by the songs we sing. Consequently, many of our songs are designed to generate worshipful feelings. The original “Amazing Grace” was not written with an emotional climax, so Tomlin gives us a chorus with a building and rising melody that pulla our feelings up, along with our hands, to that place where we feel worshipful. It is not wrong for the songs we sing to evoke worshipful feelings. Nor is it wrong to add refrains to old songs to serve this purpose. I like Todd Agnew’s “Grace Like Rain” which also adds such a chorus to Amazing Grace. Our emotions ought to be involved in worship, but so should the rest of us. The choruses that Tomlin adds to the best of our traditional hymns are designed to make us feel worshipful–more worshipful than we would feel if we sang the hymn in its original form. Fine. Unfortunately, these additions are often shallow and trite. They can make us feel worshipful, but they do little for our mind or imagination. Life is a path with hidden snares. Our heavenly bodies will be like the sun. Because of Grace, death is a mere veil. These metaphors engage our minds, our emotions, and our imaginations. And they contribute to holistic worship. Let’s look at one of these metaphors. Here the poet metaphorically compares the Lord to a shield. All kinds of meaning flow from this comparison. Most clearly, the Lord protects us for our entire lives. But a little deeper is the idea that life is a war, and that we are in desperate need of protection. It’s interesting that the song doesn’t name the threat, only the shield; this song is about God and his Grace; our foe can be the subject of other songs, not this one. This is the power of metaphor–it is layered and complex and they can surprise you even after you’ve sung them a hundred times. Mixed metaphors are not magical. On the surface, a mixed metaphor looks like a metaphor, but it is a comparison that doesn’t work. I am the bread of life, and I lay down my life for the sheep. Unlike a metaphor, this silly comparison does not lead to deeper reflections on who Jesus is–it has no magic. It just leaves us puzzled. The chorus that Tomlin added to the most beloved of hymns climaxes on a mixed metaphor. “Like a flood, his mercy reigns” is a mixed metaphor. It is saying that God’s mercy is like a reigning flood. But floods don’t reign. This is like saying, “Like a flood, his mercy shines.” Or soars, or melts, or skates. Floods flow. They overwhelm. They cover and destroy. They glut, stream, spate and surge. For various reasons, none of these work very well as a replacement for reign–but, hey, it’s very is hard to write good poetry. 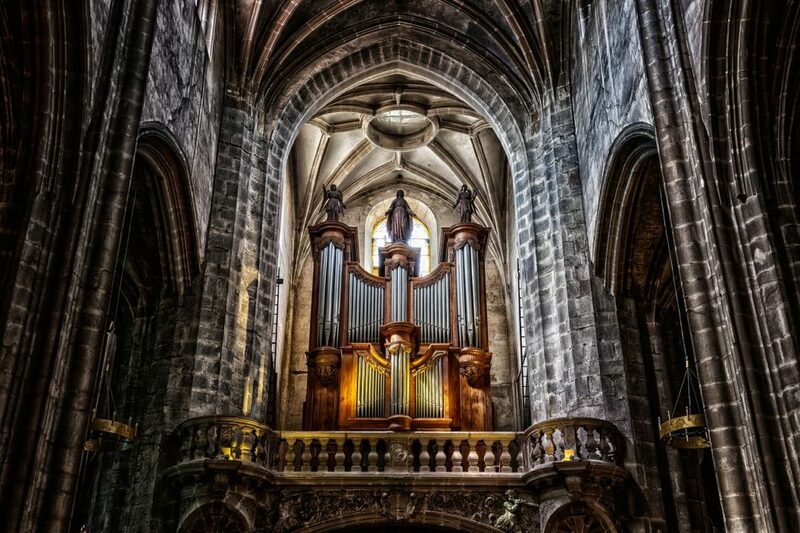 If we are going to add choruses to the old hymns, indeed if we are going to write worship songs at all, they should be the best we can make them, in every way possible. Tomlin attempts to provide an emotional high in the singing of “Amazing Grace,” but this mixed metaphor makes this possible only if the worshipers don’t think about what they are singing. It seems to me that we ought to sing songs that are like a symphony firing on all cylinders. Bad Theology in the “New” Doxology? New doesn’t necessarily mean improved. This is certainly the case for “The New Doxology” by Gateway Worship. The first verse of the new one is the same as that of the old one, but they’ve added a chorus. This recent fad of taking some of the greatest hymns of the Christian faith and adding a little ditty of a chorus, presumably, to make it more palatable to a contemporary audience, is not bad in itself (unless, of course, as the cynic in me wonders, it’s just a cash grab–to produce a popular song without having to go through the trouble of writing one). We like to sing choruses these days, so it’s fine to write one for the ol’ classics. But at least make it a good one! By “good” I mean that it ought well crafted poetically and it should be Biblical. This is where “The New Doxology” misses the mark. It has us singing bad, or at least weak, theology. The original song, published in 1709 by Thomas Ken, emphasizes the extent of the praise that the Triune God deserves as the source of all blessings. It is a call for all “creatures . . . below” to praise him. Importantly, “creatures” doesn’t mean animals, but all things that were created. “Creatures here below” is the entire physical creation–which he called “very good.” The inclusion of the “heavenly hosts” in the injunction emphasizes that there is nothing that is not called to praise him who made it. The scope of this particular line is cosmic. With man’s sin, everything fell, so the Fall is cosmic too. But God set into motion his plan to redeem everything–a Cosmic Redemption. Jesus said as much in Matthew 19:28, where he speaks of the “the renewal of all things.” In Colossians, Paul says that God will “reconcile to himself all things, whether things on earth or things in heaven” (1:20). We see the consummation of this Biblical theme in Revelation 21:1, with the coming of the new heaven and the new earth. Genesis to Revelation point to a Cosmic Redemption–not just of human souls, but human bodies as well; not just of humans but of trees and mountains as well. Christ Tomlin is up to much the same thing. He added a ditty to one of the greatest (and most popular) hymns of the faith, Amazing Grace. Besides the new bridge showing a complete lack of understanding of how metaphors are supposed to work (the line, “And like a flood His mercy reigns” is a mixed metaphor; floods don’t reign, kings do), he brought back the sixth verse of the song, which had been dropped from hymnals, presumably because of its theology. Here again salvation is brought to the level of the individual; the rest of creation will “dissolve” and “forebear” to do what it was created to do. It seems to me, if God is only able to redeem human souls from all that he made and called “very good,” the devil will have won and “all creatures here below” can give up their praising, for they are all doomed. The idea that God saves only human souls to live with him in a spiritual heaven is contradicted by the Bible. So where does this idea come from if not in the Bible? Plato. Plato believed that the physical world was distinct from and inferior to the rational world of Ideas. When Christianity interacted with Greek culture, the ideas of Plato became Christianized. The world of Ideals sounded a lot like heaven and we accepted the idea that physical and spiritual things are separate, and we took on the idea that the physical world is evil. These are Greek ideas, not Biblical ones. To sing of “The God who saved my soul” we are in danger of reducing God to a mere saver of souls. Are we perpetuating the pagan idea that material things are not “good.” If so, we are reducing God’s concern, and consequently ours, from all things to just some things. It was my impression, from listening to many sermons and podcasts of several different denominations, that the reductive “souls only” redemption was fading out. After all, we no longer sing the old hymns that promulgated the idea. But we’ve got song writers stepping in to mess up the theology of a new generation of Christians. If the good folks at Gateway actually believe that Christ redemption is for individual human souls then my critique still stands for the chorus still contradicts the verse. 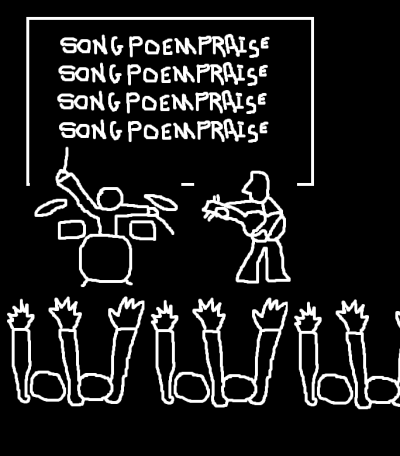 For those congregations that believe in a cosmic redemption, please, let’s just use the “old” doxology, or write a chorus that represents the greatest of all blessings–Redemption–in its cosmic scope.